Taratur – Taratur is a traditional Macedonian summer side dish prepared with yogurt, cucumbers, and garlic. Taratur is a summer side dish that is usually served with grilled meat. But for the reason that Orthodox Christmas Fast always starts right around Thanksgiving, it has become a tradition in my house to serve it for the last time of the year on Thanksgiving Day; it is our last indulgence before our strict Fast. Just as an FYI, during Fast we are on a complete Vegan diet for six weeks; six weeks before Christmas – 7th of January – (our Church still follows the Julian Calendar) and six weeks before Easter. Taratur is similar to Tzatziki, but it is not the same. 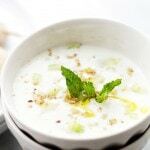 The variations are in the extra ingredients used in Taratur and in the thickness of the yogurt; the yogurt used for Tzatziki is as thick as a spread, whereas the yogurt for Taratur is a lot thinner because Taratur is meant to be eaten with a spoon. Taratur - Taratur is a traditional Macedonian summer side dish prepared with yogurt, cucumbers, and garlic. Chop up the cucumbers and try to absorb as much of the moisture as possible by drying off the cucumber pieces with a paper towel. Place the cucumbers in a bowl. Mince the garlic and add it to the cucumbers. Sprinkle on the salt and mix it all together. Pour in the yogurt. 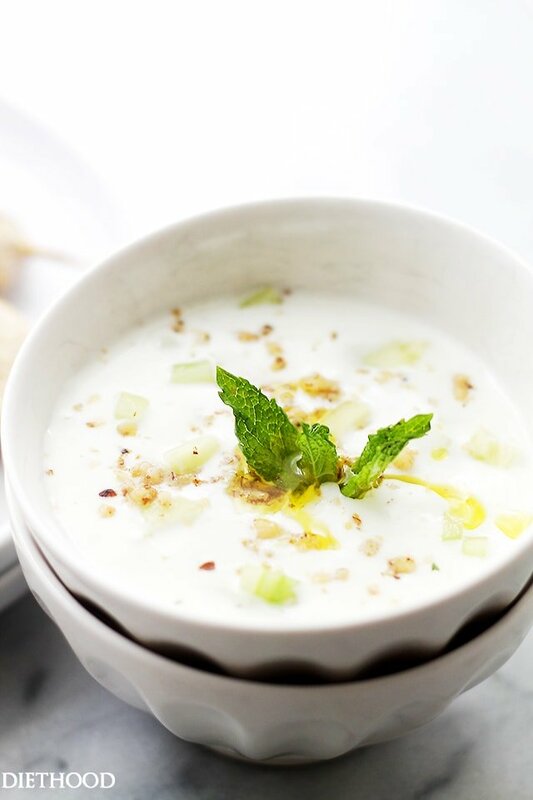 If the yogurt is not thick enough, you can use 1/2 cup of sour cream and 1/2 cup of yogurt - blend them well before you pour the yogurt over the cucumber mixture. Mix it all well and top it with the ground walnuts. Sprinkle on the olive oil and add the mint. Chill before serving it in an individual cup-sized bowl. This look wonderful! Really easy for making! This is great! I will make this soon.